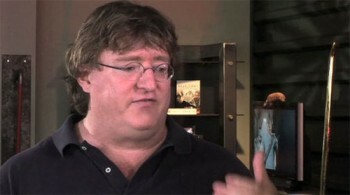 Forbes estimates that the Valve CEO is worth somewhere in the region of $1.5 billion. According to Forbes, game industry behemoth Valve is more tight-lipped about its finances than other companies of a similar stripe. For that reason, working out how much money it's making from Steam and its various bestselling games becomes a bit of a guessing game. Still! Forbes has a responsibility to figure out who's worth what and make the rest of us feel achingly poor, right? So that's just what it did. By "[consulting] with video game industry insiders, equity analysts, investment bankers, and technology analysts," Forbes was able to draw up a reasonably reliable estimate of Valve's net worth. The final figure is around $3 billion (insert "Valve can't count to three" joke right here) for the company as a whole, of which CEO Gabe Newell owns more than 50%. If we take the $3 billion figure as a reliable estimate, that puts the estimate on Newell's worth at an eyewatering $1.5 billion. This makes Newell the 854th richest billionaire out of the world's 1,226 billionaires. Whew. Valve's Steam service, which still dominates the digital download market by a huge margin, is likely the driving force behind the company's massive net worth. With over 1,800 games available from more than 50 publishers, it faces very little in the way of competition (though EA continues to pimp its Origin service, its user numbers pale in comparison to Steam's). While we all knew that Valve (and by extension, Newell) were worth a lot, billions is perhaps an unexpected word. Still, it's not like they haven't worked for it - Newell has often reiterated that customer experience is the central ethos behind Steam, and its user base count speaks to its efficiency.